2-3 medium zucchini, cut into noodles (use a vegetable spiralizer)Here’s a great site for a recipe on the zuchinni noodles, click here! In a small bowl, whisk together the broth, 1/2 of the soy sauce and starch. Set aside. Place a large sauté pan or wok over medium heat. Add 2 tablespoons olive oil and and heat it for 1 minute. Add the garlic and ginger and cook for 2 minutes, stirring constantly. Add the chicken & remaining soy sauce to the pan and cook, stirring as needed, until cooked through, about 4 minutes. Season the chicken lightly with sea salt and pepper and then transfer to a plate, leaving any liquid in the pan. With the pan still on medium, add the remaining 1 Tablespoon of olive oil, then add the bell pepper, red onions and snow peas and cook, stirring constantly, for 3 to 4 minutes until the vegetables are crisp but tender. Add the prepared sauce and cook, stirring constantly, for 2 minutes until the sauce thickens slightly. 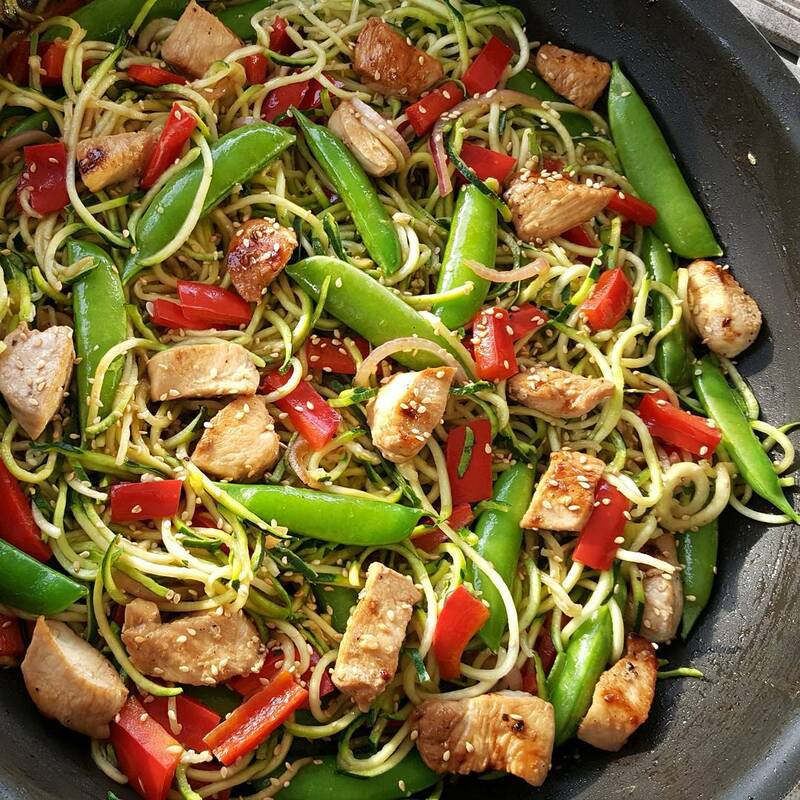 Return the cooked chicken back to the pan, stirring to combine, then add the zucchini noodles and cook, tossing to coat, for 1-2 minutes.